You feel that you are all sorted when you fix a good gutter on your roof. You think that all the water and debris will get into the gutter and you don’t have to take care of it. The problem arises when the leaves and debris start clogging the gutters. To get rid of this problem you fit in gutter covers, gutter guards or gutter helmets on your gutters. These are the solution to all your problems for some seasons in a year. But the problem arises in winters. With the extreme temperature conditions, the water which is present on the roof turns into ice. Water freezes on all the awkward positions on your roof. This water then forms ice dams on all the positions and clogs all the pores and forms icicles on gutters. When it comes to gutterlesss rain gutters, they are the most likely to stop working in the winter season because all the openings in its plating systems gets clogged by ice dams, thereby restricting it to perform all its operations. These ice dams totally stop the working of the entire gutter and the guards on your roof. Other than that ice dams can also build up on your roof. They can build up anywhere like in and around the shingles and between the gaps of shingles too. Ice dams can build up absolutely anywhere on your roof. 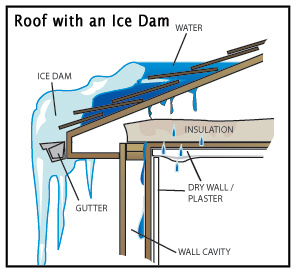 Ice dams can occur and build up anywhere on the roof. They can be on the gutters, the soffit or on the roof shingles. These ice dams are self made by the adverse effects of the climate. They build up naturally and there is absolutely no way in which we can prevent the buildup of ice dams. It is a natural phenomenon. All we can do is remove the ice dams that have buildup on their own. To prevent ice buildup on roof, you can use different strategies. You can use a special adhesive ice and water barrier. This barrier will prevent ice dam buildup. When you install your roof gutters and the roof shingles properly, then also the buildup of ice dams can be prevented. You can ensure the ice damming prevention on the roofs and gutters by setting up a proper ventilation system on the roof. You can also set up a proper insulation system as well to ensure the prevention of ice dams in gutters and in roofs. You can use a simple rake and scratch off all the ice buildup form your roof. You can take help of hot rods. You can also take help of tablets of ice. These tablets help in melting away the ice naturally. Also you can take a hose full of salt and keep it on the ice on your roof or on your gutter. This will help in melting the ice there. You have to get rid of the ice on your roof because if the roof gets heavy it may even collapse. We have discussed about ice dams on gutters and roofs. We have also discussed ways to remove them and to prevent them. It is very important to take up measures to prevent them else they can create a choking condition for gutters. Preventing ice dams on roofs and preventing ice dams in gutters is easy if proper procedure is followed.